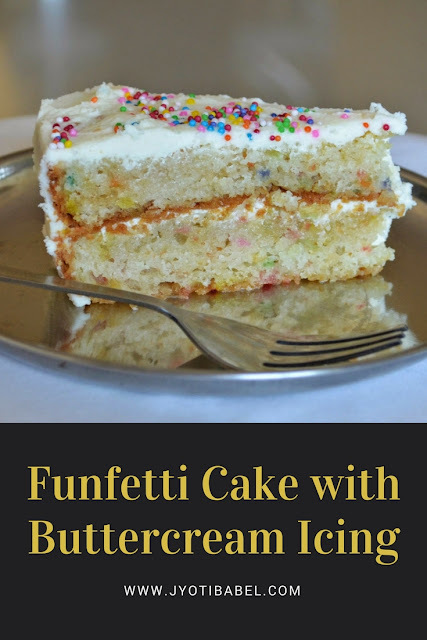 This funfetti cake is a simple eggless vanilla cake embellished with cute and colourful funfetti. I have made it more indulgent by covering it up with buttercream icing. Given that the cake can be quite colourful, it is sure to be a hit with kids. It has been quite a while since I updated this blog with a cake recipe. It is not that I am not baking these days, it is just that I am not experimenting too much; I am sticking to my tried and tested recipes most of the times. 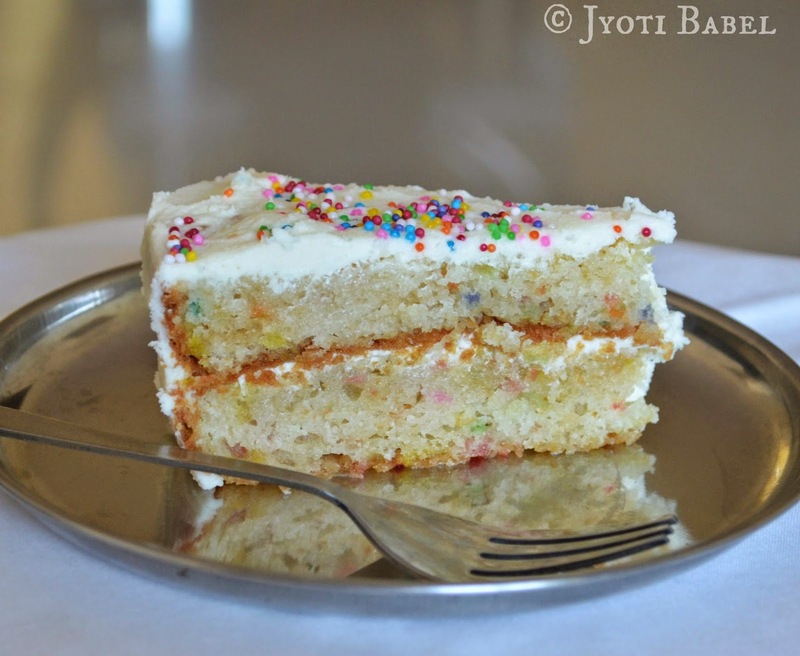 The cake I am sharing today is a simple vanilla cake adorned with cute little colourful sprinkles. This one got a thumbs up from DH. So, it makes perfect sense to share it here. Initially, I didn't plan to blog about it. So, I didn't take proper pictures of the full cake. But, since it was a hit at home, I decided to blog about it. the slice in the picture was only left, so I made good use of it in clicking the picture. Without much ado lets check out the recipe for my 'funfetti cake with buttercream icing'. With an electric beater, beat the butter until soft and fluffy. Add the sieved icing sugar little by little, beating all the time. Add cream and beat till the icing is well incorporated. Set aside in refrigerator till needed. 1. Preheat the oven to 180 C. Grease a 9'' round tin and dust it with flour. 2. Sieve flour and keep aside. Cream the powdered sugar and yoghurt until sugar completely dissolves. 4. Now add in vanilla essence and oil and whisk. Slowly add the flour little at a time and blend with wet ingredients. Beat well till creamy and thick. Add water/ milk as needed to form a dropping consistency batter. Stir in the funfetti. 5. Pour the batter prepared tin and bake in the preheated oven for 10 minutes at 180 C. Then reduce the temperature to 160 C and bake it for another 30-35 mins. 6. The cake is done if a skewer inserted in the centre comes out clean. Allow the cake to cool down for 10 mins then, invert it onto a plate. When the cake has completely cooled down, it is ready to be iced. Slit the cake in half horizontally and place one half on a cake stand. Brush half of the syrup generously. Spread a thin layer of the icing. Cover with the other half and brush with sugar syrup. Spread the rest of the icing over the cake. Decorate the top by sprinkling some more funfetti sprinkles. Cute and beautiful cake, fantastic icing.